mxODBC™ is the eGenix flagship product for connecting Python to all major databases, on all major platforms, using a Python DB-API 2.0 standard compatible ODBC interface. 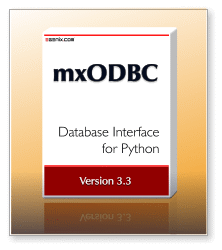 mxODBC™ provides an easy to use, high-performance, reliable and robust Python interface to ODBC compatible databases such as MS SQL Server and MS Access, Oracle Database, IBM DB2 and Informix , Sybase ASE and Sybase Anywhere, MySQL, PostgreSQL, SAP MaxDB and many more. It is an extension to our eGenix.com mx Base Distribution. ODBC refers to Open Database Connectivity and is the industry standard API for connecting applications to databases. In order to facilitate setting up ODBC connectivity, operating systems typically provide ODBC Managers which help set up the ODBC drivers and manage the binding of the applications against these drivers. On Windows and Mac OS X the ODBC Manager is built into the system. On Unix platforms, you can choose one of the ODBC managers unixODBC, iODBC or DataDirect, which provide the same ODBC functionality on most Unix systems. If you are looking for a remote database connectivity solution for Python, you may be interested in our mxODBC Connect product, which eliminates the need to have an ODBC driver for the client side of the application. It specializes on remote database connections such as the ones you typically find in web-applications, e.g. where multiple Linux servers need to communicate with a company database running on a Windows server. Python Database API 2.0 Compliance: the mxODBC API is fully Python DB-API 2.0 compatible and implements a large number of powerful extensions. Support for all recent ODBC Versions: mxODBC works with ODBC drivers implementing the ODBC version specifications 2.0 - 3.8. Support for all popular ODBC Drivers: mxODBC includes adjustments and work-arounds to support MS SQL Server Native Client, MS SQL Server ODBC Driver, FreeTDS ODBC Driver, Oracle Instant Client ODBC Driver, IBM DB2 ODBC Driver, Sybase ASE ODBC Driver, Netezza ODBC Driver, Teradata ODBC Driver, PostgreSQL ODBC Driver, MySQL ODBC Driver, .MaxDB ODBC Driver as well as the ODBC driver sets of EasySoft, DataDirect, OpenLink, Actual Technologies. Support for all popular ODBC Driver Managers: mxODBC comes with subpackages for the native Windows and Mac OS X ODBC managers, as well as the ODBC managers unixODBC, iODBC and DataDirect, which are commonly used on Unix systems. 32-bit and 64-bit ODBC: mxODBC supports both 32-bit and 64-bit versions of the ODBC standard on all supported platforms. Stable, robust and reliable:the mxODBC API has been in active production use for more than 10 years. ODBC Catalog & Introspection Functions: mxODBC Client API provides methods e.g. to list tables, find column specifications, query index relationships, etc. Full Unicode Support: use Unicode for managing text data in your client applications - even if the database does not natively support Unicode, mxODBC will automatically provide the necessary conversions on-the-fly. Supports Python type binding and Database type binding for efficient data exchange. Supports new Python 2.7 memoryview objects. Full Python Support: mxODBC works with Python 2.4, 2.5, 2.6 and 2.7. Full 64-bit Support: mxODBC runs on the following 64-bit platforms: Windows, Linux, FreeBSD and Mac OS X. Highly Portable Codebase: in addition to the already supported platforms for mxODBC, we provide custom porting services for more exotic platforms. Easy installation: using Windows installers, our Python distutils compatible prebuilt Python packages or setuptools/zc.buildout/pip compatible egg package archives. Easy configuration: use ODBC manager GUI tools for easy configuration of ODBC data sources, then access these data sources by name from Python. The eGenix mxODBC distribution includes the mxODBC package needed to connect Python to an ODBC manager. However, it does not include an ODBC manager or any ODBC drivers. You have to have these installed in order to be able to use mxODBC with Python. Linux systems usually come with at least one of these ODBC managers preinstalled. Please see the mxODBC User Manual for setup instructions. On Mac OS X, you can use the system system ODBC manager (which is a version of the popular iODBC manager). Please see the mxODBC User Manual for setup instructions. The eGenix.com mxODBC Distribution is a commercial product and made available under the terms and conditions of the eGenix.com Commercial License Agreement, Version 1.3.0 (PDF file). When purchasing a license for the mxODBC product, you will receive a digitally signed Proof of Authorization together with a license file authorizing you to install and use the product. mxODBC is available in different editions to meet your specific needs. Please see the mxODBC Editions section for details. If you would like to evaluate the eGenix.com mxODBC Distribution, please request an evaluation license or send an email to the eGenix.com Sales Team and include the following information: name of the licensee, number of evaluation licenses. We will then send you the requested number of evaluation licenses for the mxODBC Professional Edition. The evaluation licenses have a built-in timeout of 30 days, but are otherwise fully functional. Production licenses for the mxODBC product can be bought via our eGenix.com Online Shop. Licenses are sold per Python installation. If you are installing the product on a shared server which is accessible over a network, then you have to purchase a separate license for each machine that can access the installation via this server. For prices and volume discounts please check the mxODBC License Shop Page. We also offer site and corporate licenses. Please write to sales@egenix.com for quotes on these. The edition features are enabled via the license files that you receive after purchase. The download packages are the same for all editions. The new low-cost Standard Edition License allows installation of mxODBC for use in one Python installation. Depending on the edition variant, it allows working with MS SQL Server, Oracle, IBM DB2 or Sybase ASE database backends only. The maximum number of connections per process is limited to 10 connections. If you need to connect to multiple database backends, ones which are not listed here, or have a need to more than 10 connections per process, please have a look at the Professional Edition. This edition is ideal for users who normally only work with one specific database backend. The Professional Edition License allows installation of mxODBC for use in one Python installation. There is no limitation on the database backend or the number of open connections per process - you can benefit from the full mxODBC functionality on all platforms. This edition is ideal for users in more diverse environments and in situations where the number of connections should not be limited, e.g. in a web server environment. The Professional Edition Upgrade License provides a way for existing mxODBC customers to upgrade their installations from mxODBC 2.0, 2.1 or 3.0 to the new version 3.1. The license provides the same advantages as the Professional Edition License, comes at a lower cost and replaces the old CPU license of your previous mxODBC installation. For developers who want to integrate mxODBC into an application or product, we offer a Product Development Edition License which allows royalty-free redistribution of mxODBC as part of a product built by a developer. Developer licenses for the mxODBC product can be bought via our eGenix.com Online Shop. Licenses are sold per developer and product, e.g. if you have one developer working on two products integrating mxODBC, you will need to purchase two licenses. If you have three developers working on one product, you will need to purchase three licenses in order to benefit from the royalty-free distribution right. For prices please check the mxODBC Product Development Edition License Shop Page. Volume discounts are available on request. Please contact the eGenix.com Sales Team for quotes. If you are looking for upgrades to your existing mxOBDC Developer CPU Licenses, we provide a Product Development Edition Upgrade License which allows to upgrade an mxODBC 2.0, 2.1 or 3.0 Developer CPU License to an mxODBC 3.1 Product Development Edition License. After upgrade, use of the original license from which you upgraded is no longer permitted. Please note that we have changed the licensing scheme for mxODBC development licenses to a per-develeper and product based one, to better meet our customer's requirements. If you have questions, please contact the eGenix.com Sales Team. For prices please check the mxODBC Product Development Edition Upgrade License Shop Page. Volume discounts are available on request. Please contact the eGenix.com Sales Team for quotes. If you want to redistribute mxODBC as part of a product on a per-installation basis (rather than on a per developer and product basis), you can do so by purchasing standard or professional edition licenses in bulk and then redistribute these to your customers. For larger volumes we also have a special reseller agreement to simplify the process. Please write to the eGenix.com Sales Team for instructions and more information. The manual includes an installation guide, a discussion of the design principles behind mxODBC, as well as a reference of the available programming interfaces. The PDF file is also available as part of the installation and can be found in the mx/ODBC/Doc/ folder. Before continuing with the download of mxODBC, first make sure that you have installed the eGenix.com mx Base Distribution (version 3.2.0 or later), since the eGenix.com mxODBC Distribution is an add-on to our base set of Python extensions. The downloads below do not contain any license keys. You will either have to obtain evaluation licenses or buy production licenses in order to successfully install and use the package. Select the right download for your platform and Python version and then head on to the installation instructions below. By downloading, installing or using the eGenix mxODBC Distribution, you agree to the terms and conditions set forth in the eGenix.com Commercial License Agreement 1.3.0. You will need to have one of popular ODBC managers for Unix installed on the target system: iODBC 3.52.x or unixODBC 2.3.x. We have successfully tested mxODBC with iODBC 3.52.7 and unixODBC 2.3.0. For unixODBC 2.3.1 and later please create a symlink from libodbc.so.2 to libodbc.so.1 as mentioned on the unixODBC news section. mxODBC is a commercial product for which we do not make the source code available. The licenses you receive from eGenix after purchase or request of an evaluation license are packaged as ZIP file having one directory per license file set. In order to install the license file set to a specific Python installation, please unzip the license ZIP file and copy the two files mxodbc_license.py and mxodbc_license.txt from the license directory to a directory on your Python installation's sys.path / PYTHONPATH, e.g. to the Python installation's site-packages/ directory. mxODBC will then pick up the license files from there during startup. mxODBC is in production use by several Fortune-500 companies, including Intel, IBM, Google and Royal Bank of Scotland. Several of these have integrated mxODBC into their products. The most well-known of these is probably the UltraSeek search engine. Please see the mxODBC References & Quotes page for more details or write to sales@egenix.com for more information.